This Visualizing Health Policy infographic spotlights public opinion on health reform in the United States as of 2017. The largest percentage of Democrats and Republicans give top priority to lowering out-of-pocket costs for health care. However, other priorities vary by political party: 63% of Republicans versus 21% of Democrats view ACA repeal as a top priority, while 67% of Democrats versus 55% of Republicans view lowering the cost of prescription drugs as a top priority.. 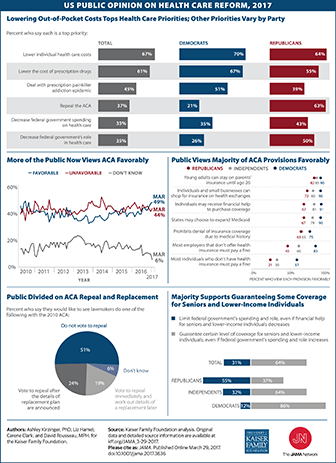 Although opinions of the ACA have varied over the years, in March 2017, 49% of the public view the ACA favorably and 44% view it unfavorably. The majority of individuals in both political parties feel positively about many ACA provisions, including allowing states to expand Medicaid and prohibiting denial of insurance coverage due to pre-existing conditions. However, only 21% of Republicans and 30% of independents favor the individual mandate that requires paying a fine in the absence of health insurance. The public is divided on what should happen to the ACA: just over half say they don’t want lawmakers to repeal the law, about a quarter want a repeal only after replacement plan details are announced, and only 19% favor an immediate repeal in advance of a replacement plan. A majority of the public (64%) supports guaranteeing a certain level of health coverage for seniors and low-income people, even if the federal government’s spending and role increases.